In the above, [ ] represent checkboxes and ( ) represents radiobuttons. User can select multiple sweeties, but upon selecting "none" all the checkbox fields should be cleared, and vice versa: when "none" is selected, selecting any of the checkboxes should clear the radio in "none". From UX perspective, is it ok to follow this way? Just to clarify: "None" does not mean "none of the above". Instead, it means that user does not like sweeties at all. In other words: the options included as checkboxes are just a subset of all possible sweeties. User can choose one/multiple of the sweeties or select "none". One conclusion is that the form does not cover a situation when user likes other sweeties than the ones listed as options, so definitely the form should also include "Other, please specify:" field as well. So at least I am not alone in my belief that this is the right way to do it. There should never be just one radio button, as it breaks the user's expectations on how they work. Radio buttons are meant to allow selection of one and only one item from a set of several radio buttons. () I don't like sweeties. Or you can change the "none" radio button to a "clear selections" button. Split it into two questions: 1. Do you like sweeties? and if yes, then 2. What kind of sweeties do you like? If no, then move on to the next question. Turn it into a dynamic/interactive question. When the user clicks on Yes, you can have an accordion reveal or just pop down the subsequent options. Ask yourself if the none option is really needed. Without it a user simply checks the sweeties he/she likes, or check none. To clear he/she unchecks them. The wording could be Please check the sweeties you like. Which sweeties do you like? I have been a member in five different survey companies: one worldwide, three Nordic/Scandinavic and one local. 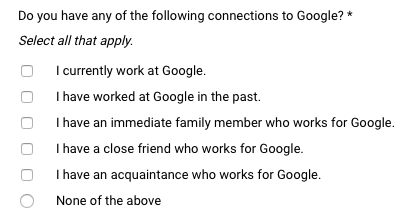 Almost every single one of the surveys contains this kind of questions, a mix of checkboxes and radio buttons. In last month, have you seen advertising for following brands? In general, None of the above, Don't want to answer, Not applicable, Don't know, are the most common radio button additions in all kinds of checkbox question sets. If you see yes/no, you might not remember any specific brand, it's an open-ended question without suggestions, so you'll get a greater percentage of no clicks then you would otherwise. If you see the brand name, it might remind you that you indeed saw an ad from that company. If this style is confusing, I doubt it would be so widely adopted. Having no checkboxes checked does not convey information - you can't tell whether the user simply missed the question entirely or not. If you must have an answer, then the two level approach (2 radio buttons, with checkboxes under one of them) is the only thing that will work. Not the answer you're looking for? Browse other questions tagged forms checkboxes radio-buttons or ask your own question. UI for multi-select with at-least-one requirement? Is it acceptable practice to use checkboxes as radio buttons?